notice things that perhaps you had not seen in the past. When I was diagnosed back in June, the initial weeks were so very difficult. We searched for HOPE, and I clung to this verse. "We have this thing called HOPE as an ANCHOR for the soul." Since then, I have this thing for anchors and what they represent. I found a lot of information about anchors from this website. I highlighted the primary symbolism in purple. Originally, the anchor symbol was not used by those on the water, but actually people on land! During the early years of Christianity, Christians were under heavy persecution by the Romans. To show their religion to other practicing Christians under the watchful eye of the ruling people, they would wear anchor jewelry or even tattoo anchors on themselves. The anchor was seen as a symbol of strength as anchors hold down ships even in the stormiest of weather. It was also a popular symbol because of its close resemblance to the cross. Anchors were also used to mark safe houses for those seeking refuge from persecution. As repeatedly mentioned anchors are all about being strong and stable. No matter if you have sea legs or not, you can appreciate the deeper meaning of the anchor symbol - security, stability, and being grounded. It is a symbol demonstrating that a person is in tune with themselves and hold on to the values they believe in. The anchor can also represent a person who has been someone's rock through difficult times. 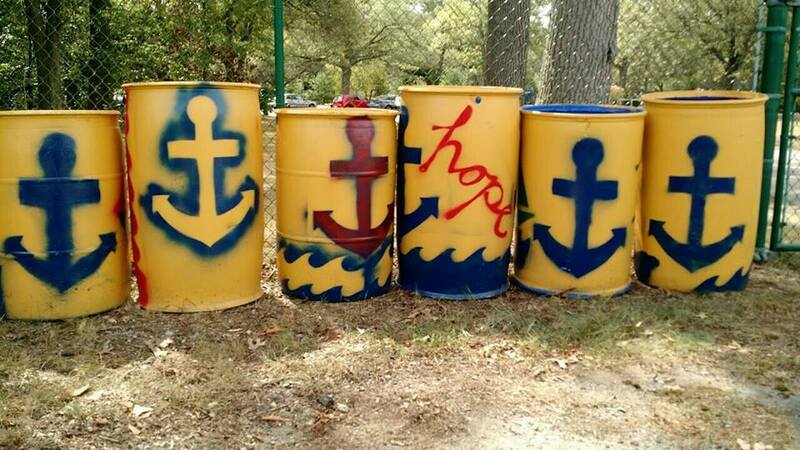 For some people, the anchor represents always having a safe place to go home to. Especially for those who travel a lot, this symbol can have a very special meaning. Those who have had a tumultuous past, the anchor is a pledge to move on and have a better, brighter, grounded future. In this case, some people choose to wear a cracked or broken anchor, as a sign they are letting go of their inhibiting ways and moving forward. These days I really tend to cling onto signs around me as they continue to fuel me and give me hope. I'm not sure if I'm just now noticing that there are so many anchors or have they become a recent fad? I feel like they are everywhere...I see them constantly. My uncle posted this picture to my FaceBook wall yesterday, taken at the local park. We went for a look ourselves today. The men working there didn't even know where they came from and offered to let us take them. We graciously declined. If I bought or collected everything with an anchor on it, well, I'd be on an episode of Hoarders. But, I can take pictures and they don't take up that much room. So, I think it would be fun for you to join me and be on the lookout for anchors and when you find them, add the hashtag #lindasanchorsofhope on FaceBook On the Leap for Linda page and/or Instagram. It will be fun (for me anyway). Oh, and don't forget to share where you saw it. Next up...an anchor scavenger hunt. "Life's roughest storms prove the strength of our anchors."